I’m so excited! Okay maybe it’s weird to be excited about new ring gates, but I am. And look at how small my house is. Only two of them will fit, and kitty corner at that. LOL. I just got these the other day. They will help me and the dogs get used to being inside an obedience ring. Heck, any kind of ring. I got 4 gates and 5 stanchions… though I only got 4 stanchions and not sure if I ordered 4 or 5 now. I’ll have to ask since we did a group order. They will really help us to practice the Go Out in obedience. I know that’s not until Utility… (which is after Novice and Open, for those who didn’t know), but still, we practice all the levels. It’s fun. Novice is mostly heeling, and you can only heel so much without being utterly bored. So we mix in the fun, more advanced, stuff at the same time. Like scent articles. Those really are fun. 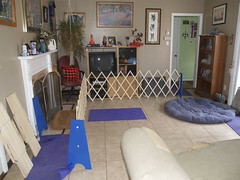 Today is flyball practice. I’m going to attempt to bring four dogs… Chase, Tatum, Muffit, and Levi. Levi told me he wants to do flyball, so I’m going to train him up. Why not? He won’t be fast, but he’ll have fun! Hahaha…hope you enjoy your new ring! I have a husky and I don’t think this ring is stable for my puppy. Any suggestions? .-= Cathy´s last blog ..Mackey wins Copper Basin 300 =-. Cynthia: Where did you buy your ring gates?